In most parts of the country, late fall has brought about chilly mornings and colder evenings. Maybe I should get a portable heater, you think. But then you remember how badly you start sneezing when that fresh Christmas tree goes up. Then I should probably get an air purifier. Here’s what we say: get both! 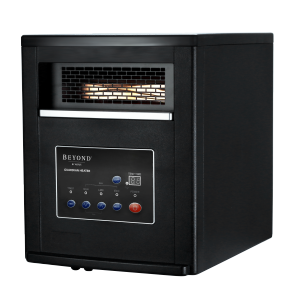 The all-new Beyond by Aerus Guardian Heater was designed to be an efficient heater and air purifier combination. You can choose to heat your space, purifier the air in your space, or do both at the same time…making the Beyond Guardian Heater perfect for year-round use. What makes the Beyond Guardian Heater so extraordinary is the addition of our exclusive ActivePure Technology, which supercharges water molecules, turning them into “scrubbers” that then remove contaminants from the air and surfaces of your home. ActivePure Technology destroys up to 99% of contaminants in the air and on surfaces, and was originally developed by NASA researchers for use on the International Space Station. ActivePure is the only air cleaning technology awarded the prestigious Certified Space Technology seal by the Space Foundation. Consumer Reports found that lowering a thermostat 10 to 15 degrees for eight hours can cut a heating bill by 5 to 15 percent a year. They also estimate that according to average electricity rates, it would cost $2.82 a day to use a space heater for 16 hours (adjusting for 8 hours of sleep, during which time a space heater should not be used).